Considered one of the strongest and certainly the most beautiful of joints, the dovetail exacts a stiff price in terms of skill for the strength and good looks it provides. In this article we’ll go over some dovetail basics, including variations in form and different methods for cutting dovetail joints. If you’d like to know more about anything, we’ve also included links to additional tips, tricks, and how-to articles and videos throughout this article. Anatomy of the joint: Pins and tails make a locking joint in a number of variations. By hand or machine: The best are cut by hand. Alternative dovetails: Sliding dovetails and dovetail keys are close cousins of the traditional joint. Dovetails are probably the strongest method for joining two pieces of wood, surface to surface, with the grain running in the same direction. The dovetail joint provides considerable mechanical strength because when the joint is assembled, it can’t be twisted or racked. And the shape of the dovetail makes it impossible to take apart in one direction and difficult in the other. This joint stays together — even without glue! The dovetail joint is made up of two parts. The tails are the flared, triangular shapes, cut through the thickness of one board. The pins are the more slender projections, cut along the grain of the other board. There is an ongoing argument/discussion as to which part should be cut first. 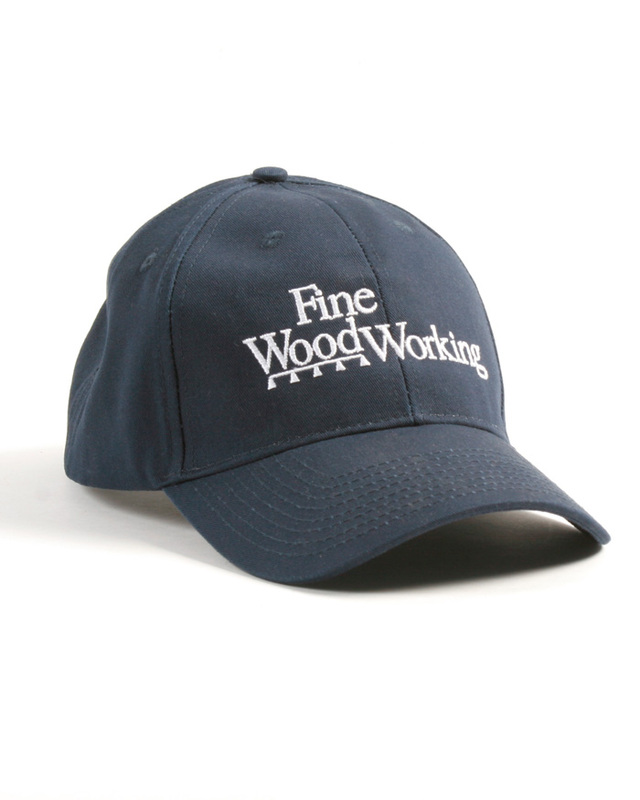 Generally, European trained woodworkers believe the pins should be done first. There are basically three types: through, or full, dovetails are used to join carcases, blanket chests, and small boxes. These are regarded as the strongest and most beautiful. Half-blind dovetails are commonly used to join drawer sides to drawer fronts and occasionally are employed on the construction of carcases. 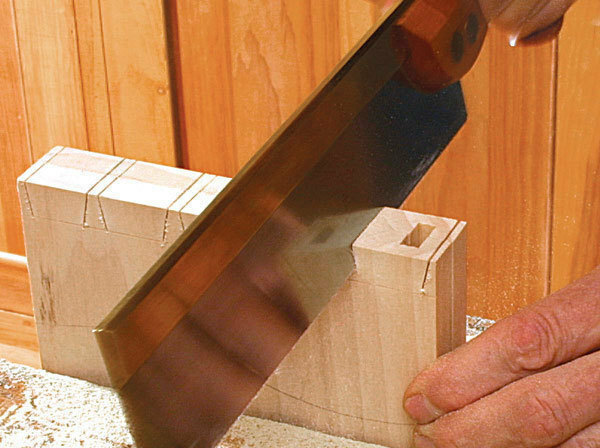 Full-blind or secret dovetails are rarely used because when assembled, the dovetails — and all the work — are completely hidden. 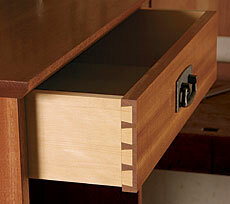 Half-blind dovetails are the most common joints for attaching drawer fronts to drawer sides. 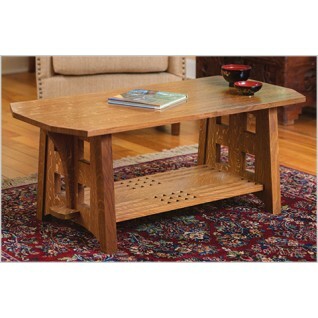 Although historically, dovetails were strictly employed for practical reasons, today, they appear on furniture primarily for decorative and aesthetic reasons and have come to symbolize fine craftsmanship. Today, there are jigs that enable a woodworker to cut dovetails mechanically, but the end result appears static and too uniform. 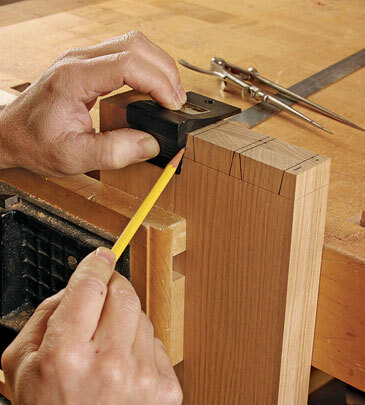 The best-looking dovetails have always been cut by hand. Christian Becksvoort has cut thousands of dovetail joints, learn how he streamlines the process in his article, My Favorite Dovetail Tricks. 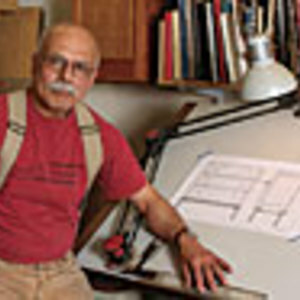 Cutting dovetails by hand is considered a real benchmark in the development and training of a furniture maker and is a skill every novice woodworker aspires to master. Cutting good dovetails begins with a good layout. Deciding the angle, number, size, and spacing of the dovetails is critical to success. Generally, the widest portion of the pin should be equal to 1/2 the thickness of the material. The angle of the dovetail is generally between 15° and 20°. The spacing (space between the pins) is usually twice the width of the pins. However, always keep in mind the intended purpose of the project. 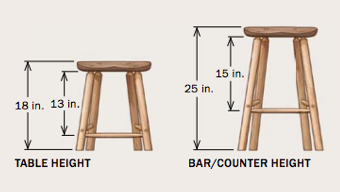 Utilitarian projects can have thicker, fewer pins. 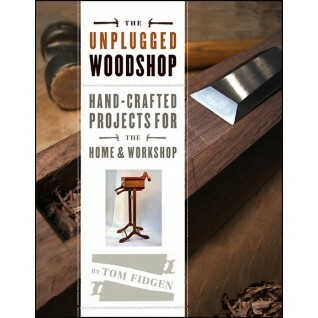 It would be a waste to cut fine, delicate dovetails on a tool box that will be subjected to rough and careless handling. 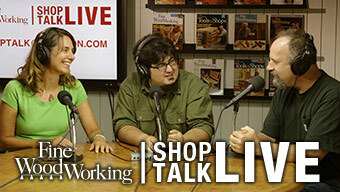 If you want to skip the hand work, dovetails can also be cut using machines such as the tablesaw, bandsaw, or router. 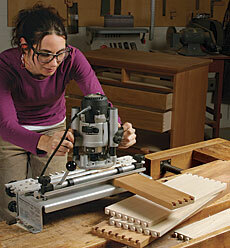 Use a router and a dovetail jig to dovetails with speed and ease. Sliding dovetails employ the same concept as the traditional joint, but more resemble the tongue-and-groove joint. A tail-shaped tongue slides into a pin-shaped groove, and won’t pull apart when glue is applied. This is a good choice for joining partitions to a case piece, as it prevents the sides from pulling away from the partition. The dovetail key is a device that spans a natural wood defect or a man-made seam to mechanically lock two pieces together. The bowtie shape is cut from solid wood, with the grain running lengthwise, and set into the surface of a board at 90° to the grain. With the key in place, the “butterfly” shape prevents the board(s) from separating. 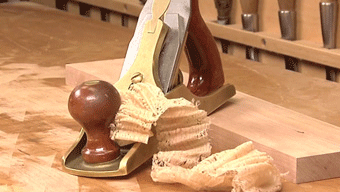 The recess for the key can be cut entirely by hand, or the bulk of the waste can be removed with a router, followed by a chisel to clean up the corners. The dovetail key is used primarily to reinforce and strengthen a joint. 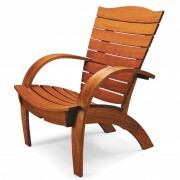 It’s also used to stabilize a natural flaw or defect in a piece of timber. 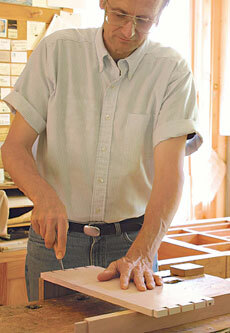 World famous woodworker George Nakashima used dovetail keys extensively in the furniture he built.